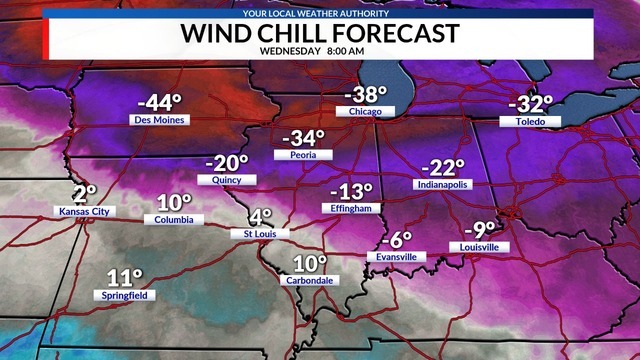 Peoria, IL - Temperatures fell below zero across Central Illinois on Friday morning with wind chills between -15° and -26°. The bitterly cold temperatures followed a string a cold fronts that have brought round after round of snow, rain, and ice to the region over the past few weeks. Unfortunately, the weather pattern remains very active and the coldest temperatures are set to move in early next week. A storm system will organize across the Northern Plains on Sunday and then dive southeast into the Midwest Sunday night and Monday. While the storm track remains uncertain, moderate to heavy snow will be possible across northern Illinois while a mix of rain, snow, and ice impacts Central Illinois. Snowfall amounts remain uncertain but there is more confidence on what is to follow...record setting cold. I'll stop short of calling this a Polar Vortex as the actual Polar Vortex will remain near the North Pole. 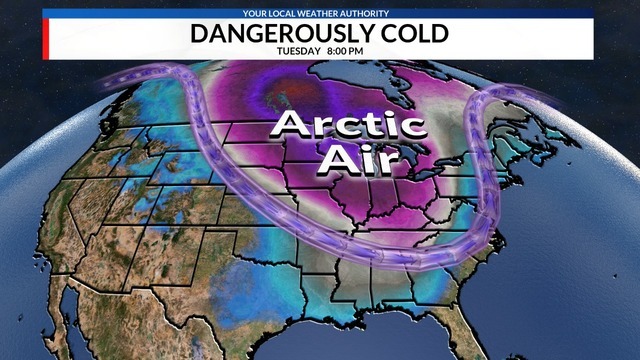 However, thanks to warmer temperatures being drawn north toward the North Pole, a strong polar low will dive south in the Midwest bringing temperatures that more common north of the Arctic Circle to Central Illinois. It's been more than 24 years since Peoria last saw a high temperature colder than -8°. On January 18th, 1994 Peoria's high temperature was only -10°. The coldest high temperature on record for Peoria is -16° which occurred back on January 5th, 1884. Unless we receive more snow than expected on Monday, it's unlikely our temperatures will rival those from 1884, but some may get within 5° or 10°. While we may not set all-time record cold temperatures, we will likely set some daily records. High temperatures are expected to range -5° to -15° on Wednesday with low temperatures Wednesday morning and Thursday morning between -15° and -25°. Wind chill values Wednesday night are expected to range from -30° to -40°. Here are some records for the Peoria area. Undoubtedly records will be challenged next week as temperatures remain well below zero for 36 hours straight. Its not yet clear just how cold these temperatures will get since snowpack from Monday's storm system and the extent of cloud cover on Tuesday, Wednesday and Thursday will impact how low those temperatures will go. However, confidence is high on a significant blast of cold air moving into Central Illinois from Tuesday night through Thursday.